With our schedules and our lives getting busier and more complicated, going to the dentist every six months may seem like an inconvenience. There has never been a more important time however, to take charge of your oral health than now. This is because we now understand that there is a link between your oral health and your overall health and well being. Dr. Yelena Obholz, your premiere dentist in Washington, DC, explains why preventative dentistry is so important. Studies have shown a connection between periodontal (gum) disease and other health concerns in the body such as diabetes, cardiovascular disease, high blood pressure, and stroke. What we know is that gum disease can contribute to these other health concerns and vice versa. Maintaining your oral health promotes good overall health. Gum disease occurs when plaque and tartar build up cause your gums to separate from your teeth allowing harmful bacteria below the gum line to cause inflammation and infection of the bone and tissues that surround your teeth. The bacteria can enter your bloodstream and travel to other areas of the body, which contributes to other health concerns. Gum disease is one of the oral health concerns that we screen you for at every cleaning and checkup appointment because it’s much easier to treat in its earliest stages. In fact, if it’s detected early when it’s gingivitis, many patients are able to reverse their condition. If left untreated, gum disease will eventually lead to bone and tooth loss. When you visit us every six months for cleanings and checkups we can help you be proactive about your oral health and we can also prevent many oral health concerns from happening in the first place. During your cleaning, our highly skilled hygienists will remove the excess plaque buildup that causes gum disease and tooth decay. 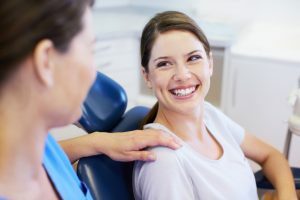 They’ll also take the time to educate you about your oral health and proper brushing techniques that will ensure that you make the most of your home care routine. You’ll also see Dr. Obholz for an examination so we can detect things like oral cancer, tooth decay, and gum disease in their earliest stages. Your health and well being is too important to ignore! Contact our office today to get your next dental appointment scheduled.